Everyone falls victim to stress at some point. There's always something difficult going on in life: money, relationships, health, work, parenting, home ownership, vehicle repairs, flight delays, technological issues, legal situations and personal problems. You can't control what happens in life, but outside of solving the causes of stress, you can control your reaction to it by practicing self-care. One of the best ways to take care of yourself is through exercise. Exercise is not only good for your physical health, but it also benefits your mental health by releasing endorphins that elevate your mood. You'll feet fitter, more confident, more energetic, stronger and able to take on anything that comes your way. An added bonus is that you can get into great physical shape, and you'll sleep better at night. Varying your exercise routine will prevent boredom and adaptation. When you do the same workout every day, it eventually becomes less effective. To make sure your body isn't adapting to the exercise, challenge yourself by switching up your program or hitting the gym and using a variety of machines. If getting to the gym regularly is difficult for you, you can set up a home gym in a garage space, spare room, or basement. 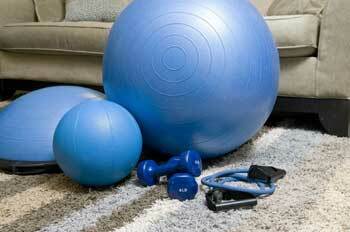 A home gym could include a weight bench or cardio machine such as an elliptical, bike or treadmill. For inexpensive alternatives, fill your gym with weights, resistance bands, stability ball, kettlebell, medicine ball, and yoga mat. It's not only about exercise. Balance your fitness routine with overall self-care by making it a holistic practice. Incorporate a healthy, nutritious diet that's heavy on vegetables and lean protein into your fitness program. Getting fit doesn't have to be about vanity, but improving your eating habits as you exercise will keep you in your best physical -- and mental -- health. In fact, your gut health is partially responsible for your mood. To keep your microbiome in check, consider adding probiotics to your diet. You can get them naturally from foods like yogurt and kefir, or you can take probiotic supplements. Sleep is another big factor in caring for your wellness. As much as we need to consume and expend energy for survival, we also need to rest and recharge. Sleep is where that happens. Getting enough sleep will ensure that you're able to recover from the day and prepare for the next. It gives your body a chance to relax and your brain a chance to reset. Make sure to get enough sleep each night, even if that means sacrificing a half hour of Netflix. If you have trouble falling asleep at night, try changing your diet or exercising more during the day. You might find it easier to sleep when everything is working smoothly on the inside. Stress and sleep go hand in hand. When you're under stress, it's more difficult to sleep. When you're not getting enough sleep, you'll feel more stressed. Manage your stress so you can get more sleep, and vice versa. Big stressors in life can't always be avoided, but a positive attitude and the implementation of stress-reduction techniques can help mitigate the effects of stress. Yoga, meditation and getting out into nature have positive impact on your stress levels. So will a spinach, apple and avocado smoothie. The reason self-care is so important is that it positively affects your stress levels, which in turn affect your mental health. Stress can lead to depression and anxiety if it's not managed well. It has effects on cognitive changes, moods, coping strategies and irritability. These problems can show up everywhere in your life, which can then make you even more stressed. Thus, the cycle continues. Care for yourself by treating your health right and keeping your mind calm. If you care about your wellness, then there's no place for stress and unchecked anger. There is plenty of room for healthy habits including eating clean, exercising and getting enough sleep. There's even more room for playtime and enjoyment, too. Self-care isn't only about what you need, but it's also about what you want.